Click on the button below to buy this product now at a discounted price! 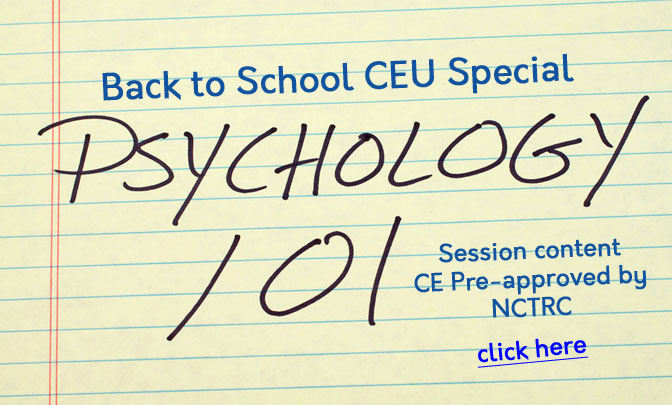 Five clock hours (0.5 CEUs) Session content CE Pre-approved by NCTRC. FREE book included ($20 value). Offer will end soon. Sign-up today! Get this self-study CEU product now at discounted price + FREE book included! Course Objective: Independent learner is to read the (2015) book, Psychology in minutes: 200 key concepts explained in an instant by Marcus Weeks and pass an online quiz based on the book with a score of at least 70% or better within a one-year timeframe. How do I take the Psychology 101 course, I just paid for it, is there somewhere I can find it?